"And stop callin' me Tonto, it's Tony, I told ya. Show some respect, at least, can't ya. After all I done for you." 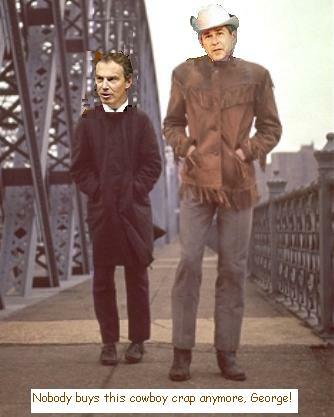 The stars were spotted taking a stroll on location in New York, between shooting scenes for Benighted Cowboys - a remake of Schlesinger's classic movie of platonic and profane love. Shouldn't this have been titled Everybody's Talkin' At Me? I hope that photo is not a fake. Ed. He looks more like a stand-up comic than a cowboy, here. It's wonderful how he and Tonto stay so cheerful when you look at all the other pictures on that page. But still, I imagine they don't look at those. Yes, that must be their secret. By the way, Tonto is going to go on and on and on just like Calamity Marge did back in the Dodge City boom days. "I know Mikey can't wait to get here. Send him my love and tell him to keep playing those video games. They're great practice but believe me, nothing is as awesome as smoking their asses in real time." The pictures of the wounded children show the reality behind Cowboy Bush and Tonto Blair's rotten war. We are literally beside ourselves with joy - and insufferably full of ourselves too - to announce that The London Silence, a book by one of ourselves from the Willesden Herald is now on sale in the Willesden Bookshop, in the Willesden Library Centre on Willesden High Road*, and it's by Stephen 'Willesden' Moran, one of our irregulars. According to the blurbs, "This story collection carries us like an outgoing tide, on a wave retreating from the underworld of 21st century London to a Dublin hinterland in the 70’s, 60's and beyond, to the time of coalmen, tenements, and bicycles." You can learn more about the book here. Moran says, "They're all here, the charmers, the snakes, the innocent, the complaisant, the guilt-ridden and the guilty, the Brothers, the whores, the poor and the young, the invulnerable, the jailed and the dead, the green and the truant, the music box and the p.a, the skaters, the crooners, and the pink neon sign that blinks all night, saying keys, keys, keys..."
To order signed copies direct from the author: Kagi. It's now starting to filter through to the online bookstores. Amazon.co.uk has it before Amazon.com, for example. Click the links to order from the following: Amazon.co.uk, Powells (first to have a picture of the cover.) To find the best price you could try Addall price comparisons, for UK, or for USA. To order from high street bookshops or other online suppliers, quote ISBN 0974726141. "THE release of Israel Prisons Authority prisoner number 1005962 has the makings of a Hollywood movie, albeit a decidedly silent one if it is up to the government of Ariel Sharon, the prime minister. "Better known to the world as nuclear whistleblower Mordechai Vanunu, he will be leaving the walls of Israel’s Ashkelon Prison tomorrow after 18 years in jail, 12 of them in solitary confinement*." Ghandi, Mandela, Vanunu - these are the people who do something good with their lives. To hell with the warmongers. *Is solitary confinement really a punishment, compared to sharing a prison cell with other people? It sounds more like a reward. Ed. Thanks, cheerio! That's all one of the richest companies in the world gave to 19 year old Matt Thompson for discovering a security loophole in one of its database products, and helping to fix it. Think about that before you waste any of your precious time helping them, or giving them online content (for example) for nothing. The Guardian is now running the Martin Amis short story online, which might explain why the New Yorker didn't include it online - separate online rights. See earlier post for more details. Waste spammers time, make them work, make them sweat, make them go to the bank, all for nothing. Yes. Hahaha. Have a good laugh at the spamming vermin chasing their rat-tails. Make a sport of it. Full marks to Spambuster419, and lets have more ideas about how to make spammers lives a misery. Meanwhile here is a testcard, a selection of pictures by our invaluable photographers, Ossian Lennon and Onion Mbeke. Due to a technical improbability with our transmitter, we are unable to bring you your usual Willy. We apologise for this abnormal service, and rest assured we are not doing nothing about it (repeat 'not.') Normal service will be resumed as soon as humanly possible, if not sooner.